A Ferrari comeback in Magny-Cours was nicely timed in terms of the world championship, and while points leader Lewis Hamilton didn't lose too much ground to his Italian rivals, the competition is closer than it was before. And with the top four drivers now on two wins each, there's a nice symmetry about the results as we reach the halfway mark of the season. Ferrari won in France fair and square, and the fact that Kimi Raikkonen was able to jump Felipe Massa at the second round of pitstops shows that it's not only at McLaren where an intense intra-team rivalry is gathering steam. But the Maranello team were certainly helped by a below-par weekend for McLaren, where the management readily admit that they didn't quite get things right this time. So what went wrong for McLaren, and what did the team do to try to recover? The first signs of trouble came on Friday, when Hamilton stopped on the circuit early in the morning session with an electronic problem. The car was returned to the pits by the marshals and he eventually put in some laps later in the session, but the programme was disrupted. Quick times from Ferrari piled on the pressure. On Saturday morning, it was Fernando Alonso's turn to experience trouble. Again it was a minor glitch with a brake sensor, but it kept the reigning world champion in the pits until the very end and meant he lost priceless track time in a session that's vital in terms of preparing for qualifying. 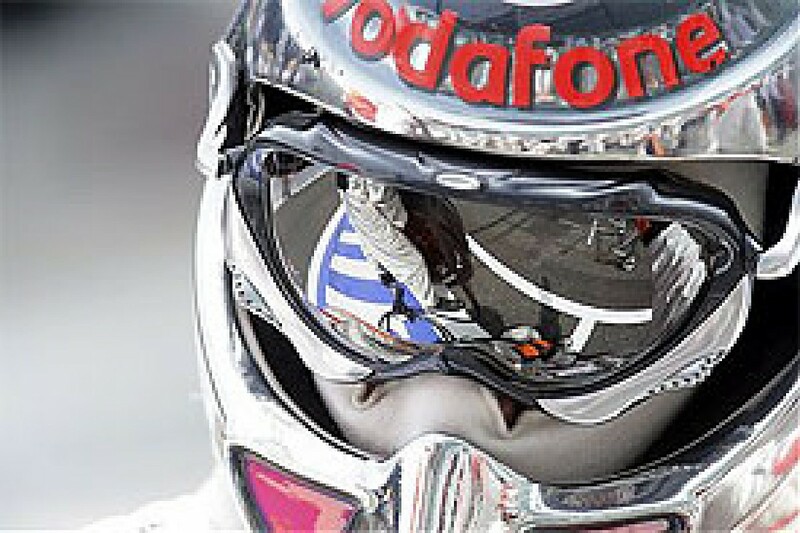 However, overnight changes had found performance, and Hamilton was quickest, albeit by just 0.063 seconds, over Massa. It was close and extremely hard to call, and the first stages of qualifying didn't help anyone get a clear picture. In Q1 Lewis was ahead of Kimi by 0.068 seconds, and in Q2 he edged Felipe by 0.027 seconds. Both of those sessions in theory provide the perfect guide to the ultimate pace of the cars; convinced that Hamilton had proved the silver car had the pace, McLaren decided to go for it and attempt to lock out the front row by running both drivers as light as they dared in qualifying. Once again the team demonstrated that they are giving both drivers a fair shake by handing them identical fuel loads - enough to take them just 16 laps into the race. The team could only hope that the Ferraris didn't choose to run quite as light, and thus securing the front row would be a little easier. As ever, the two leading teams sent their cars down to the pitlane at the earliest possible opportunity, and all four were sat with the engines idling for what seemed like an age. Interested observers at Spyker noted that Alonso's car appeared to clunk into gear exceptionally early, and one can only guess whether or not that had a bearing - no pun intended - on what happened next. In fact after driving out of the pits Alonso soon realised that he has a problem, and he was straight back in. It was a rare ceramic bearing failure, something that had failed only once before in three years of use. The bottom line was that Fernando could take no further part in the session, and was thus doomed to start 10th with the fuel that was still in the car - a load that was only ever going to work if he was at the very front. In the event, things didn't work out for Hamilton either. He admitted to making a mistake, and the result was Massa got ahead to the tune of 0.070 seconds. This was another good effort by the Brazilian, and only when the race unfolded did we discover that he was fuelled to go to lap 19, and was thus carrying three more laps of fuel. We've tended to take the fuel burning phase a bit for granted lately, but this was quite a significant one and it showed that there is a sound reason why the top guys seem so keen to sit at the end of the pitlane with their engines cooking. 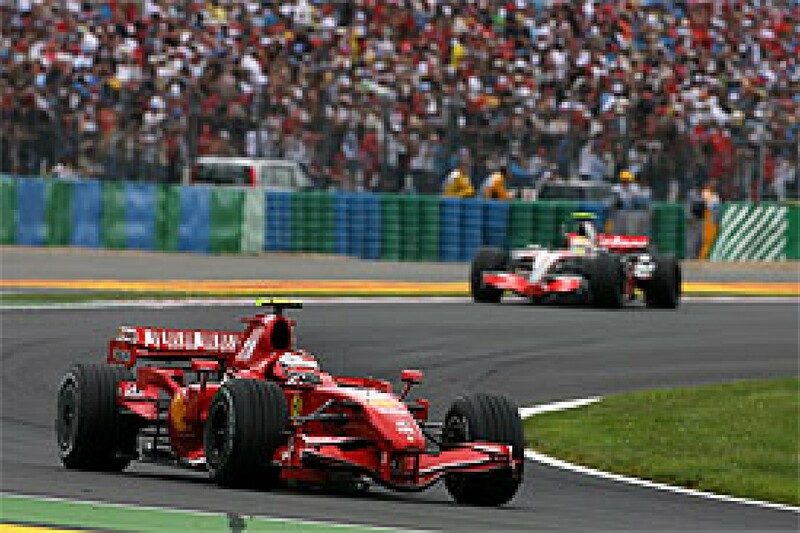 Having got to the front of the queue, Raikkonen ran 13 laps, compared to the 12 of Massa and Hamilton, and thus earned himself an extra lap in the race. He would stop as late as lap 22, which meant he was a couple of laps heavier than his teammate in qualifying. Intriguingly, Alonso was ahead of Hamilton in the pitlane queue, and as soon as the Spaniard hit trouble, the Briton's engineer got on the radio and told him he had to try and earn another lap, something he just failed to do. "It was very, very tight to try and get that extra lap," McLaren CEO Martin Whitmarsh said afterwards. "We had Fernando in front, so he would have been in the best place to do it, and we were reconciled with Lewis to not getting that extra lap. Obviously when we had the problem with Fernando we had the opportunity to push with Lewis and try and get the extra lap, but it was too tight. "I think we had about an eight-second margin to go out there, do the fuel burn, do the pitstops, and do two runs. Kimi was the only one who was able to do it [earn 13 laps] by pushing along at the front. We did at the last one with Lewis by pushing harder at the outset." When it all shook out, Massa was on pole ahead of Hamilton and Raikkonen. There was quite a big margin to the Finn, but he knew he had extra fuel, and Alonso was down in tenth and no threat. All was not yet lost for Hamilton. He still had a chance of beating Massa into Turn 1, although that's not easy from the inside spot at Magny-Cours, but he could always have a go into the hairpin. The threat from Raikkonen was tempered by the knowledge that he had endured some pretty dire first laps lately. However, Hamilton had a poor time trying to get away from the dirty side of the grid, a problem that also afflicted BMW's Robert Kubica, immediately behind. Normally by that stage of the weekend there would have been some rubber down on the dodgy side after two GP2 races, two Euro F3 races, and the Porsche Supercup, but rain in the morning had put paid to that. And a bad start from Hamilton coincided with Raikkonen finally getting it right. So now Lewis was down in third with what the team knew was the lightest load of the three - it really was the worst case scenario. When he came in for his first pitstop on lap 16, the option existed for a longer second stint and a two-stopper, but fearful of dropping him into traffic, the team decided to go short and keep him on a three-stop schedule. It was a strategy that raised a few eyebrows up and down the pitlane, but McLaren's theory was that beating the Ferraris was no longer and option, and the three-stopper was the best way to consolidate third. "Sometimes you've got to be pragmatic, take the points, and move on to the next race," said Ron Dennis. "That's what it was, pragmatism. That's why we switched Lewis's strategy, it was a way to keep him out of trouble, keep him out of traffic. It wasn't designed to give him a shot at second; it was designed to make sure he came third." There was also the issue of tyres. Nobody was very keen to get on to the softer option tyre, but they all knew they had to at some stage. A three-stop strategy would mean that Hamilton only has to use the less-favoured tyre in that short final stint. Hamilton had one especially exciting moment when he came out of the pits just behind Kubica. Informed he was racing the Pole for position, the Briton immediately fought back and pulled off a great passing move of the type we've been waiting for him to demonstrate since the start of the season. Funnily enough, he didn't have to do it, since Kubica was due to stop a few laps later, and thus Hamilton would have got his place back and stayed ahead after his own third stop by dint of some quick lappery. But Hamilton is not the sort of man to play a percentage game - he saw a rival, and his instinct was to pass him come what may. However, getting ahead at that stage did make his life easier and put third place beyond reasonable doubt. Crucially, it also allowed him to back off on the engine in the closing stages. "Lewis was going to beat Kubica because he had more fuel," said Whitmarsh. "But nonetheless it was great to see it, it was a fantastic overtaking, and it allowed us to take it easier on the engine. "We haven't had a single failure this year, it's been absolutely fantastic. But Indianapolis and this weekend are very hard on the engines, so we were quite keen to preserve our engines at the end of the race. "So Kimi" - Whitmarsh meant Hamilton, of course - "doing that meant that he wasn't held up for probably five laps behind Kubica, it was a good thing to do, and it was great for the fans. Whatever had happened at that juncture of the race, we had them covered." By the end of the race, Lewis was 29 seconds down on the Ferraris, allowing for some backing off to save his equipment. It would be fascinating to know if McLaren have since done the sums and worked out where he would have been on two stops. All things being equal you'd expect a double world champion in the championship-leading car to make sensible progress from 10th place, but of course Alonso's race was completely compromised by the fact that he was committed to stopping on lap 16, way ahead of the cars immediately in front of him on the grid. At least being a little lighter might have given him some advantage off the line and in the ducking and diving of the first lap. He also had another joker to play - by not running in Q3, he had a couple of new sets of the option tyre left, when everyone else had used theirs up. The team decided to start him on one of those sets and thus get the compulsory stint out of the way. This had two advantages: the tyre was known to be less favourable and would thus be used in the shortest stint of the race, and at a point where Fernando was almost certain to be stuck behind people. Secondly, a new soft tyre might give him a little edge over everyone else (on new mediums) at the start and in the course of the first lap. "We started on options," said Whitmarsh, "because with the best will in the world he was going to be in some traffic, and we felt that was the right time. You were then going to have the ability to make a long last stint, and we knew we had some primes to enable him to do that. We were able to get the option bit out of the way - it was probably a less consistent race tyre." 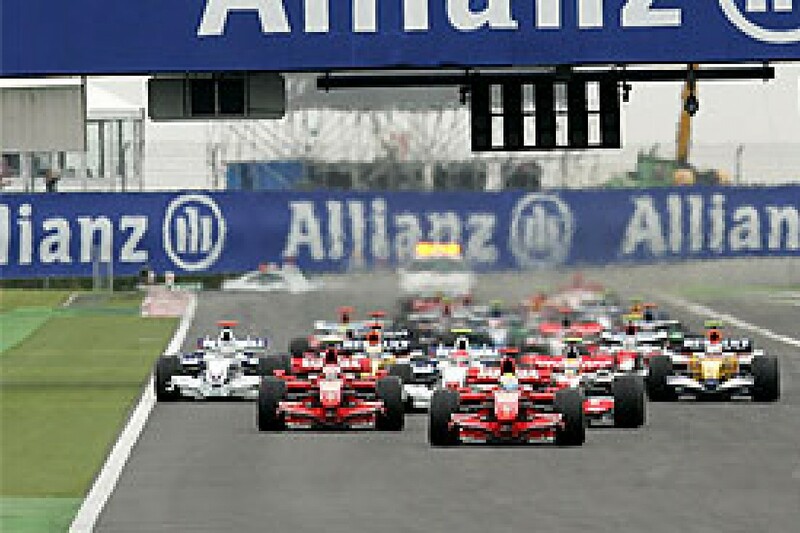 In the end, the only places Alonso gained on the first lap were those vacated by Heikki Kovalainen and Jarno Trulli when they tangled, which meant he finished the first lap in eighth. Over the course of the remaining 69 laps, the only driver he managed to successfully demote was Williams's Nico Rosberg - a clear sign of just how difficult was the job he had, having been stuck with the light fuel load. It's worth noting that Jenson Button also managed to usurp Rosberg, and he did it with a Honda from 13th on the grid. And yet along the way Alonso pulled off some brilliant passes, including one on BMW's Nick Heidfeld that was as good as any we've seen in a while. The problem was of course that he spent so much of the race in traffic.
'" had not fantastic luck all through the weekend," Alonso later commented, "and in the race I think I pushed hard, but I knew it was extremely difficult because when the pitstop time arrived, I knew that it was very easy that I was behind them again. And in fact it was that case." And it was an attempt to beat that traffic that the team did something at the first stop that surprised many onlookers. As discussed, Lewis and Fernando both came in on lap 16 (in the end the gap on the road between them made it logistically possible) because that's what was decided before qualifying - but no one expected them both to come in again just 19 laps later, on lap 37, when logic suggested that Fernando would have benefited from a much longer second stint. In fact the fear was that he would drop into even worse traffic if he hung around too long taking on extra fuel. "At the first stop we fuelled quite light," said Whitmarsh, "because at that point we were concerned that Fernando would have fallen behind the train of cars that was being led by Barrichello. "I think if you look at that stop, he came out 2 or 3 seconds in hand. If we'd tried to put more fuel on, he was in danger of falling behind that, and that would have been very detrimental to his performance, so that was the right call. "Subsequently we could have three stopped or two stopped. We certainly didn't succeed in getting Fernando into clear air for long enough during the race, but we were trying to thread our way through." Lap 16 together, lap 37 together... The paths of the McLaren drivers then diverged. Lewis carried on with his three-stop schedule, but at that lap 37 stop Fernando was filled for a hefty 33-lap run to the finish (coincidentally the longest opening stint by anyone in the field was also 33 laps, by Rubens Barrichello). Alonso was able to go for his long closing stint because he had already done his bit on those unloved soft option tyres, while most of his rivals had still to use them, and didn't want to do too many laps on them. The Spaniard was ninth when he came out of the pits after that stop, and over those remaining 33 he laps gained just two more places - when Button and Rosberg made their second and final stops. There were to be no more dramatic passes. Alonso's tyres were past their best at the end, and he could do little about Renault's Giancarlo Fisichella up ahead. "I did 33 laps, with a lot of fuel in the first 10 laps, so I damaged them a little bit, and I was not able to be too aggressive in the last couple of laps when I was fighting with Fisichella," he said. 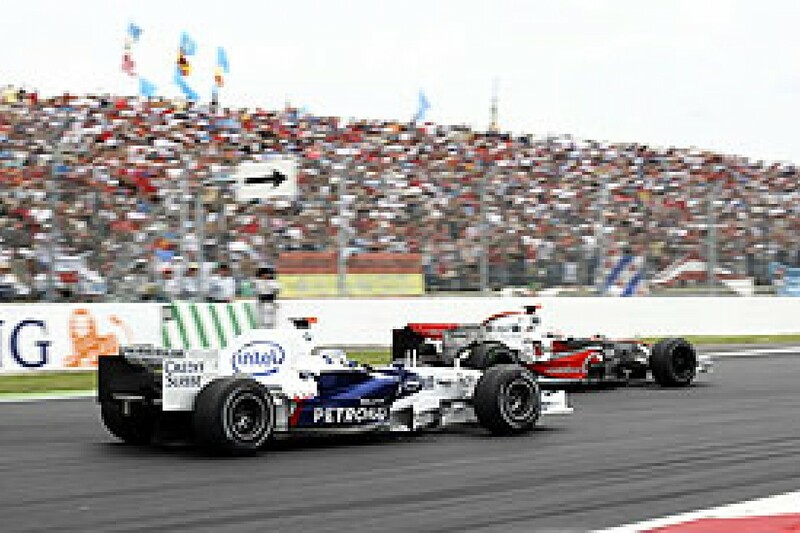 Clearly there was speed in the car - he set a better fastest lap than teammate Hamilton, one that was a huge 0.6 seconds quicker than the best by fourth place finisher Robert Kubica, so the fact that the eventual outcome was a humble seventh gave a graphic demonstration of the value of strategy and track position. Alonso enjoyed the wheel-to-wheel racing, even if it didn't actually help him much. "I knew that I was light on fuel compared to what they had, so I risked as much as I could because I knew that I must pass Nick on the track and open a gap. Unfortunately it was not enough, and he and Fisichella overtook me. If you qualify with light fuel to be on pole position and you start in 10th, the race becomes very, very difficult." 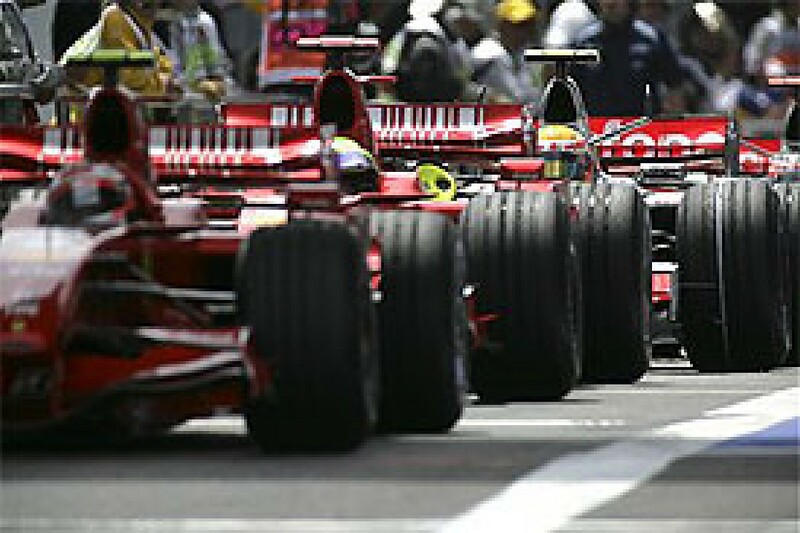 Overall, it was a case of damage limitation for the team, and the fact that the Ferrari drivers switched places certainly went down well with the Woking boys, since Massa is the more immediate threat in the drivers' championship. "I think that with Lewis, two or three stops would have got us to the conclusion that we had," said Whitmarsh. "And we knew that during the race. We debated it, and we decided on grounds of conservative safety to run three stops, to minimise the time we were on the option tyre at the end. "I don't think it would have been an issue either way. I don't think there was a strategy today that was going to make us fast enough to beat the Ferrari, so I don't think we got that wrong. "With Fernando, we ran a two-stop strategy, but you're trying to second guess other people. It may well be that a three-stop would have given him more time in free air. "He pulled off three fantastic overtaking manoeuvres, but it is difficult, and you lose a lot of time. If he was in free air he would have been the fourth car today, even from where he started. But we didn't manage to spend enough time to realise that performance. "I don't think we got the best out of the car. We weren't particularly strong in Barcelona (in the Spanish Grand Prix), and Turn 3 is Barcelona-ish. "We'd worked hard to develop the car and so had Ferrari. They had a strong package here, and I think we didn't do a good job as a team on Friday to give our drivers the best here. We made reasonable progress on Saturday. We came here to win, and the reality is we were likely to be third and fourth had we got it right. "You've got to second guess what others are doing. Maybe we could have done it better, but certainly over the course of the weekend we didn't give Fernando the best cards to play in this particular game." Alonso lost more ground to Hamilton in the championship standing, and as in Montreal, circumstances conspired against him. "I'm disappointed, no doubt," he rued afterwards. "A championship with two seventh places in the last three races - seventh in Canada and seventh here - is not great in terms of points. "In Canada I had a safety car in the lap I had to stop; here it was a gearbox in qualifying. One day this will happen to the other guys, and I will take points. That is all I can say now."